I must start this AR50 write-up with my most sincere and most profound thank you to Dennis Conner, and I wish to dedicate this blog entry to him! If I could, I would also nominate him for Coach of the Year 🙂 From that Stevens Creek Striders Christmas party that he “adopted” me, he has taught me so many things about running at ultra distance, hand-in-hand, till we crossed that finish line at AR50 on Sat! My dream could not have come true without his mentor-ship and coaching, and his great sense of humor had kept my spirit high during those tough miles on training runs and race day. For the last 2 1/2 years, I have been fighting hard for the biggest challenge I’ve ever come across — beating cancer and staying positive. I would be lying if I said I am not scared, but living in fear is just not my style. Since there is no guarantee that I will get another chance tomorrow, while going through treatments, countless lab works and doctor visits…etc, along the way I came up with some running related goals for myself, like running the NYCM, running a 50K, running at places that I saw at National Geography..etc, then there is the dream to become a real ultra runner — running my first 50 miler. Friday April 1st, I took half day off and met up with Michael, my crew captain! Yes, Team Michele has one runner, one coach/pacer, one crew captain and two crews! From the size of our team you would think we are running WS100, right?! We drove to Folsom together with trunk-load of race day supplies and drop-bags for me, snacks and drinks for my crews..etc. Boy, it’s hot on Friday and I worried about Saturday weather — I simply don’t do well when it’s warm. We got to Fleet Feet in Folsom around 3:00pm, and picked up my bib and shirt in 3 minutes. Dennis texted me “We’ll all follow the plans tomorrow, and while some parts will be hard, we’ll get you to the finish!” I promised that I will stick to our plans till we meet at Beal’s Point aid-station, and I reassured him that my Gamin was set and I would follow it faithfully! I have heard from people that I don’t listen well, too stubborn, or even arrogant, but I do listen to my coach Dennis! After a simple dinner with Michael and I Tao, I organized my two drop-bags and laid out my race day outfit — the new blue GU shirt that I just got last weekend, plus arms sleeves and calves sleeves to protect me from poison oaks thanks to I Tao’s last minute suggestion. I went to bed around 10:00pm. Sat April 2nd, woke up around 3:00am before the alarm even went off, and I stayed in bed and told myself “OMG, today is the day!” I got up and changed into my new GU shirt and hoping I would make them proud today, a company that I am proud to represent! Went through the usual race day ritual, Michael drove Flora and me to the start – Brown’s Ravine Marina. Michael just told me yesterday that he was going to crew and pace Flora today, so my crew captain has taken up a side job and ditched me. He even gave her my homework – the pace chart, talking about intellectual property! LOL!! The plan was to run at 11:30min pace for 15 mins and walk at 15:30min pace for 5 mins, and I should repeatedly doing so till I reach Beal’s Point (mile 24.31) around 11:30am. It was dark for the first 15 mins or so, but soon I no longer needed the headlamp. Michael told me that Flora is a faster and stronger runner than me, so I didn’t expect myself to run or keep up with with her. My only focus was to run within myself and stick to the plans Dennis has for me. Focus, Focus and Focus! Several of my friends have run this race before and they all told me that the first half of the course would be very similar to LGCT that we often run at. The first several miles we were inside a narrow single track dirt trail and soon took us into a park with paved path. Quite beautiful in spring with view of the lake, lavish meadows, purple flowers that I can’t name them, small rolling hills, crossing interesting Bridges, bluffs… and lots of cyclists this morning. The first 24 miles didn’t have any crew access point, so I wouldn’t get to see Michael, Vinh and Kiyoko for a while 🙁 I controlled my pace as Dennis has told me to, had GU Gel from the handy soft flask every 45 mins, and sipped my Roctane drink often. Some runners were doing interval as well, so I asked about that — 90 sec/30 sec, heart-rate based..etc, and we leapfrogged each other till I past them. With controlled speed, I heard the cowbells and cheers as I approached Beal’s Point right on target. I changed my shoes from Brook road shoes to Altra trail shoes, and I could see blister would form very soon after taking off my socks, so applied Blodyglide generously on my toes and at the bottom of my feet. I put on the Altra Olympus, sipped some water and GU Roctane drink, grabbed a rice ball from my drop-bag, and told Dennis that I am ready to go. We took a team picture, waved “Bye, see you at Rattlesnake” to my crew, and we walked away while I munching on that homemade rice ball. I rolled like a boss!! We entered a single track with Dennis leading the way, and I told him that there was another MTB Tri race that day so let’s follow the orange ribbons. He was very happy with my pace, and we covered the next 5.14 miles steadily to Granite Bay in one hour which he was even happier — “your pace is perfect!” Along the way, he kept pointing at flowers, butterflies, huge granite rocks, mountain in distance…”I see that one of my jobs today is pointing out beautiful places for you to see!” And he reminded me to drink whenever we walked up the hills “please drink some water if you can.” Such a polite and entertaining pacer! From Granite Bay to Horseshoe Bar it was a long stretch, 8.69 miles tough terrains, without aid-station. Runners were instructed to have hydration pack or two bottles. Dennis filled my pack while I went to use the porta potty, and he instructed me to drink more and had some aid-station food before we continued on. I saw a sign said “Meat Grinder” and wondered why such name. Tada!!!! I tripped and fell hard, and face-planted myself on “Meat Grinder”! No wonder!! Of course it hurt but coach wasn’t allowing me anytime for self-pity or TLC; he told pass by concerned runners “she is fine and she will get up soon!” I followed his strides as close as possible and ran strongly on downhills with jumps if necessary, and walked as fast as I could on uphills with my much shorter legs, and kept drinking. Bad news came quickly — I finished my hydration pack and we still got a long way to go till next AS! Dennis gave me his 2nd bottle and for the first time I ran with a handheld. It’s so hot out there and I was getting dizzy and nausea, and he told me we had about 15 mins or 45 mins to go — I couldn’t think straight!! Lucky that we came across a tiny creek and Dennis took my hat and dipped it into the water then put it back onto my head, then he scooped some water and cooled the back of my neck with those. What a difference water makes!! I was snapped out of the nausea and recharged with energy again! Despite how tough this section was, we were still passing runners from time to time. We made it to Horseshoe Bar and Dennis told me that “do you know that you just made a new 50K PR?” 6 hours and 30 mins 50K!! We went through the same AS routine — I went to pee and Dennis refilled my pack. 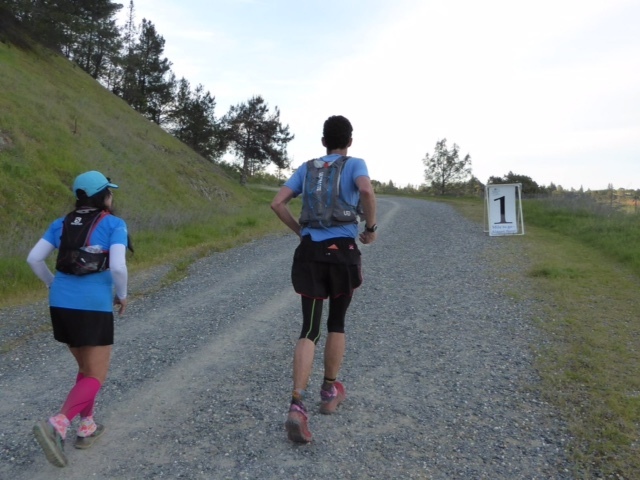 You never know that you can make someone happy when you go pee, until you run ultra. LOL!! With the hydration pack filled, GU gel stocked, we went on for 2.8 miles ascend to Rattlesnake Bar. Each stride was getting harder with the sun beaming on me and I wasn’t into conversation, but Dennis kept reminding me to “head up, eyes down and smile”, and “have some drink please!” Race day is so different than training runs because the cut-offs and distance, and I continued to learn about running ultra distance today. I could tell that coach was doing everything to bring me to the finish, and I was quite touched with his taking care of me every step. Running aside, it’s a bit amusing that I found our differences in music taste. I asked about the two concerts he went to that week, and he reacted quite exciting about this topic. “Oh yeh!! I went to xxxxx and xxxxx, and they were great!” I made no response, then he went on “do you know xxxx? do you know their work?” Too bad that my answer was “no.” Later we ran by Avery’s Pond and it got some lemna floating freely & beautifully, and this spot looked absolutely tranquil. I exclaimed “wow, how beautiful and I think Beethoven would love this place, ” but this time coach had no response, LOL! I’ve trained through the whole winter since Dennis sent me that 15 weeks training plan on Dec. 14th, but I was grilled today at 75 degree and quite exposed. Dennis asked me “what do you have at Rattlesnake Bar?” I said “same thing like my last drop bag and rice ball.” He said “you will have your crew at Rattlesnake Bar!” Oh yeh!! The thought of seeing my friends’ faces worked like Kryptonite and I was charged with brand new energy again. 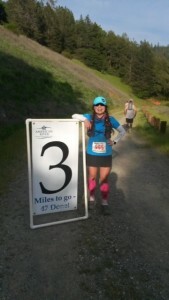 I even ran past an ultra guy from East Bay that I know is faster and stronger than I am! Before descending to Rattlesnake Bar I heard noise of spectators and I knew that we have finally made it to Rattlesnake Bar, mile 40.94. At Last Gasp I saw that huge infamous Dam Wall, and I was like “man… can’t believe this!” I shuffled my legs, walked a bit, jogged a bit… but the rule was no stopping. Dennis pointed at a random runner up there and said “see that guy in white shirt is stopping? you will not do that.” I agreed and pushed myself hard toward that “3 mile” marker. All day Dennis have been saying “my runner says thank you” whenever people commented that I was looking good, strong, good job..etc. And now he started telling people that “my runner is not allowed to stop!‘ LOL.. that just made me laugh so hard, and at the same time knowing that this is really happening — I was getting very close to become an ultra runner now. We had to wait for Michael and Flora to come in, so we probably spent a long time there and the night creep in. I wasn’t sure what happened but vaguely remember I was getting very cold and I was shriving terribly. Next thing I knew I was sitting in my car and started vomiting. Dennis put couple blankets on me and asked me to squeeze his hand. Michael drove me back to our hotel, and I didn’t get the chance to thank Dennis, Kiyoko and Vinh properly before I took off. Tue April 5th, Got text from Dennis – “will you please wear compression calf sleeves on the plane.” Haha.. his coaching duty hasn’t ended yet. We discussed briefly about another 50 mile on a harder terrain, but at this point I don’t know what my plan is for the rest of the year. However I do know that for my next race the weather will be perfect!! Ciao! !